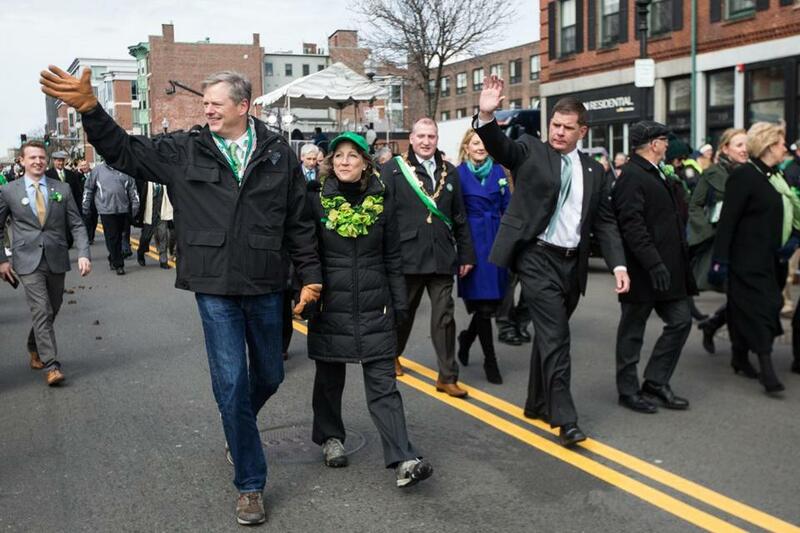 Governor Charlie Baker and Boston Mayor Marty Walsh marched in the 2016 St. Patrick&apos;s Day Parade in Boston. Oh, come on. Not this again! We were past this narrow-minded foolishness, weren’t we? After decades of controversy, openly gay veterans finally were allowed to march in the last two South Boston Saint Patrick’s Day parades. The old guard didn’t like it, but there it was. OUTVETS marched, St. Patrick did not reach down from heaven to smite the revelers, and a good time was had by all. Then, on Tuesday night, the South Boston Allied War Veterans Council, which organizes the parade, took us all into the wayback machine, voting to exclude OUTVETS once more. The reversal hurts even more than the initial rejection. Parade organizers’ attitudes have long been embarrassing. But they’re especially so now, in the context of a city striving for greatness, a city that has remade itself into a more progressive, inclusive place — especially when it comes to gay rights. The tired, tribal Boston of “The Departed” has largely departed. But here are these guys, dragging us all into the old ugly. Perhaps they, like many in this country, miss the good old days, when you could express your bigotry with impunity. Perhaps they’re emboldened by the nation’s new president, devoutly and proudly retrograde. On Wednesday night, council member Timothy Duross told the Globe that the gay veterans’ group was being denied permission to march this year because they had displayed their logo, which includes the rainbow flag, too prominently on previous marches, violating the code of conduct. OUTVETS were, in effect, too gay. Whatever the official reason, it was clear that the throwbacks who control this thing were never happy about including a gay group in the first place. After all, the US Supreme Court was on their side, finding unanimously in 1995 that the council had a First Amendment right to say who should and should not march in their parade. But after gay rights groups, and a growing number of politicians, including Mayor Marty Walsh, stepped up the pressure, they eventually gave in. Reluctantly. “The mayor and his surrogates . . . coerced them and intimidated them,” said Chester Darling, the attorney who represented the council before the Supreme Court, and continues to fight for them. In a lawsuit last year, he defended the council’s prerogatives against Walsh’s tough line. That lawsuit may have been dismissed, but those who gloried in it wouldn’t be. They voted Tuesday to turn back the clock, reinforcing the stereotype of South Boston as a bastion of intolerance, even as the neighborhood has transformed around them. It is far more diverse, and cosmopolitan, than it once was. For heaven’s sake, a Haitian-American woman now hosts the Saint Patrick’s Day breakfast (though state Senator Linda Dorcena Forry did not win control without a fight). The entire political establishment, and at least one sponsor, have lined up against the council’s decision. This year’s grand marshal has resigned in protest. Also, Ed Flynn, a veteran and son of Southie who voted with the losing side on Tuesday night, has vowed to skip the march unless OUTVETS is included. At a meeting on Wednesday afternoon, he and officials from the gay veterans group persuaded the council to hold an emergency meeting Friday to reconsider the exclusion. “I’m not giving up,” Flynn said. I am. This tiny band of myopic souls have controlled the parade — and the city’s reputation — long enough. Somebody else should organize a celebration that welcomes the whole city. A grand event, worthy of the town. Let’s give people a choice — between today’s Boston and a flashback to an unmourned past — and see what happens.